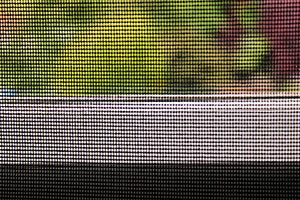 Performance Drain Cloth/Fly/Bug screen mesh is manufactured using PER® technology, the strong, robust mesh is manufactured from a 100% polyester mesh coated in PER®. A light open weave mesh, suitable for use in drain cloth applications, and for use as sunshade material, cover inserts, awnings or for outdoor cushions, window and door screens, and vegetable protection. The mesh allows air and wind through to circulate and is see-through. The mesh comes in a 0.44mm depth and weighs 103grams per square metre, with a mesh of 21 x 16 holes per linear inch. Easily cut with scissors to size and shape, it can be stapled, nailed or sewn, and is washable at a temperature up to 120 degrees. The mesh is also importantly UV stable and Fire Resistant. Its flexibility allows it to be used anywhere where you want to prevent against bugs, flies and insects i.e. screening doors and windows, in homes, boats, caravans, in the garden to protect crop vegetation or across greenhouse windows or doors. Mesh size: 21 x 16 holes per linear inch.